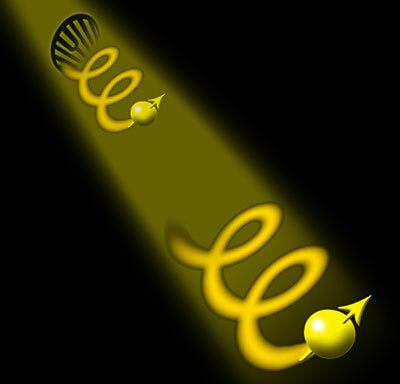 The values of two inherent properties of one photon – its spin and its orbital angular momentum – have been transferred via quantum teleportation onto another photon for the first time by physicists in China. Previous experiments have managed to teleport a single property, but scaling that up to two properties proved to be a difficult task, which has only now been achieved. The team's work is a crucial step forward in improving our understanding of the fundamentals of quantum mechanics and the result could also play an important role in the development of quantum communications and quantum computers. Quantum teleportation first appeared in the early 1990s after four researchers, including Charles Bennett of IBM in New York, developed a basic quantum teleportation protocol. To successfully teleport a quantum state, you must make a precise initial measurement of a system, transmit the measurement information to a receiving destination and then reconstruct a perfect copy of the original state. The "no-cloning" theorem of quantum mechanics dictates that it is impossible to make a perfect copy of a quantum particle. But researchers found a way around this via teleportation, which allows a flawless copy of a property of a particle to be made. This occurs thanks to what is ultimately a complete transfer (rather than an actual copy) of the property onto another particle such that the first particle loses all of the properties that are teleported. The protocol has an observer, Alice, send information about an unknown quantum state (or property) to another observer, Bob, via the exchange of classical information. Both Alice and Bob are first given one half of an additional pair of entangled particles that act as the "quantum channel" via which the teleportation will ultimately take place. Alice would then interact the unknown quantum state with her half of the entangled particle, measure the combined quantum state and send the result through a classical channel to Bob. The act of the measurement itself alters the state of Bob's half of the entangled pair and this, combined with the result of Alice's measurement, allows Bob to reconstruct the unknown quantum state. The first experimentation teleportation of the spin (or polarization) of a photon took place in 1997. Since then, the states of atomic spins, coherent light fields, nuclear spins and trapped ions have all been teleported. But any quantum particle has more than one given state or property – they possess various "degrees of freedom", many of which are related. Even the simple photon has various properties such as frequency, momentum, spin and orbital angular momentum (OAM), which are inherently linked. Teleporting more than one state simultaneously is essential to fully describe a quantum particle and achieving this would be a tentative step towards teleporting something larger than a quantum particle, which could be very useful in the exchange of quantum information. Now, Chaoyang Lu and Jian-Wei Pan, along with colleagues at the University of Science and Technology of China in Hefei, have taken the first step in simultaneously teleporting multiple properties of a single photon. In the experiment, the team teleports the composite quantum states of a single photon encoded in both its spin and OAM. To transfer the two properties requires not only an extra entangled set of particles (the quantum channel), but a "hyper-entangled" set – where the two particles are simultaneously entangled in both their spin and their OAM. The researchers shine a strong ultraviolet pulsed laser on three nonlinear crystals to generate three entangled pairs of photons – one pair is hyper-entangled and is used as the "quantum channel", a second entangled pair is used to carry out an intermediate "non-destructive" measurement, while the third pair is used to prepare the two-property state of a single photon that will eventually be teleported. 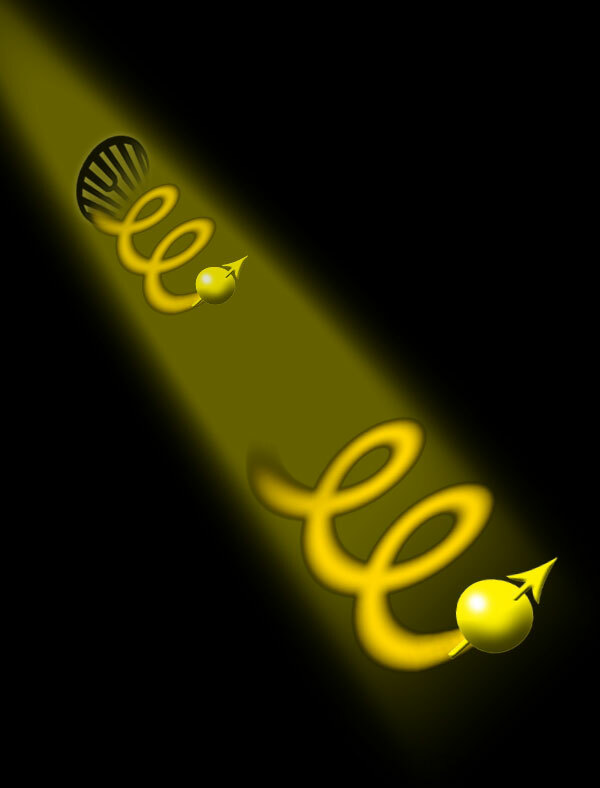 The image above represents Pan's double-teleportation protocol – A is the single photon whose spin and OAM will eventually be teleported to C (one half of the hyper-entangled quantum channel). This occurs via the other particle in the channel – B. As B and C are hyper-entangled, we know that their spin and OAM are strongly correlated, but we do not actually know what their values are – i.e. whether they are horizontally, vertically or orthogonally polarized. 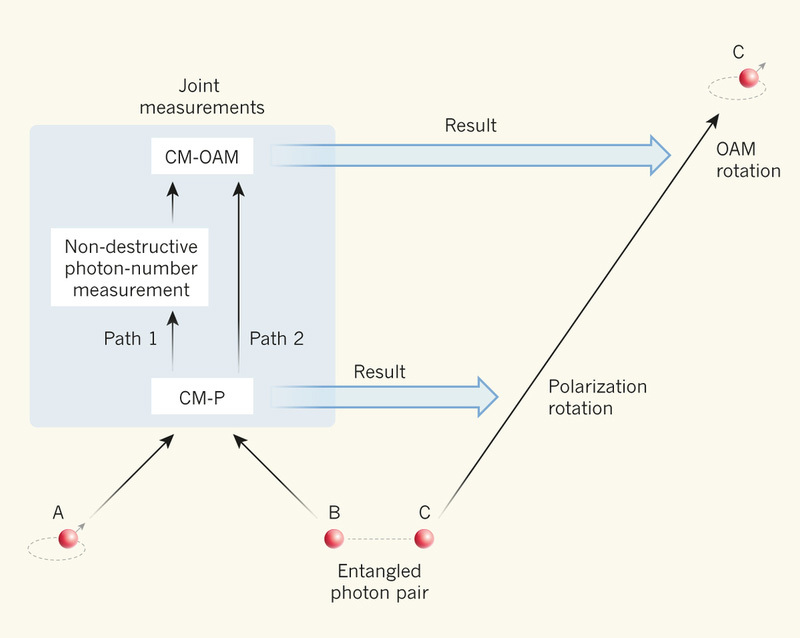 So to actually transfer A's polarization and OAM onto C, the researchers make a "comparative measurements" (referred to as CM-P and CM-OAM in the image) with B. In other words, instead of revealing B's properties, they detect how A's polarization and OAM differ from B. If the difference is zero, we can tell that A and B have the same polarization or OAM, and since B and C are correlated, that C now has the same properties that A had before the comparison measurement. On the other hand, if the comparative measurement showed that A's polarization as compared with B differed by 90° (i.e. A and B are orthogonally polarized), then we would rotate C's field by 90° with respect to that of A to make a perfect transfer once more. 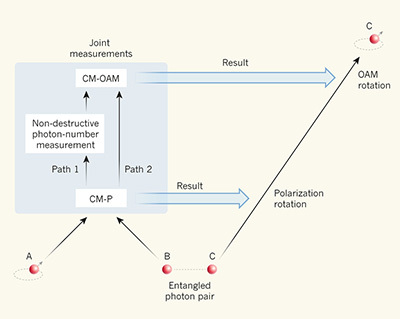 Simply put, making two comparative measurements, followed by a well-defined rotation of the still-unknown polarization or OAM, would allow us to teleport A's properties to C.
One of the most challenging steps for the researchers was to link together the two comparative measurements. Referring to the "joint measurements" box in the image above, we begin with the comparative measurement of A and B's polarization (CM-P). From here, either one of three scenarios can take place – one photon travels along path 1 to the middle box (labelled "non-destructive photon-number measurement"); no photons enter the middle box along path 1; or two single photons enter the middle box along path 1. The middle box itself contains the second set of entangled photons mentioned previously (not shown in figure) and one of these two entangled photons is jointly measured with the incoming photons from path 1. But the researcher's condition is that if either no photons or two photons enter the middle box via path 1, then the measurement would fail. Indeed, what the middle box ultimately shows is that exactly one photon existed in path 1, and so exactly one photon existed in path 2, given that two photons (A and B) entered CM-P. To show that indeed one photon existed in path two required the third and final set of entangled photons in the CP-OAM box (not shown), where the OAM's of A and B undergo a comparative measurement. The measurements ultimately result in the transfer or teleportation of A's properties onto C – although it may require rotating C's (as yet unknown) polarization and OAM depending on the outcomes of the comparative measurements, but the researchers did not actually implement the rotations in their current experiment. The team's work has been published in the journal Nature this week. Pan tells physicsworld.com that the team verified that "the teleportation works for both spin-orbit product state and hybrid entangled state, achieving an overall fidelity that well exceeds the classical limit". He says that these "methods can, in principle, be generalized to more [properties], for instance, involving the photon's momentum, time and frequency". Physicist Wolfgang Tittel from the University of Calgary, who was not involved in the current work (but wrote an accompanying "News and Views" article in Nature) explains that the team verified that the teleportation had indeed occurred by measuring the properties of C after the teleportation. "Of course, the no-cloning theorem does not allow them to do this perfectly. But it is possible to repeat the teleportation of the properties of photon A, prepared every time in the same way, many times. Making measurements on photon C (one per repetition) allows reconstructing its properties." He points out that although the rotations were not ultimately implemented by the researchers, they found that "the properties of C differed from those of A almost exactly by the amount predicted by the outcomes of the comparative measurements. They repeated this large number of measurements for different preparations of A, always finding the properties of C close to those expected. This suffices to claim quantum teleportation". While it is technically possible to extend Pan's method to teleport more than two properties simultaneously, this is increasingly difficult because the probability of a successful comparative measurement decreases with each added property. "I think with the scheme demonstrated by [the researchers], the limit is three properties. But this does not mean that other approaches, either other schemes based on photons, or approaches using other particles (e.g. trapped ions), can't do better," says Tittel. Pan says that to teleport three properties, their scheme "needs the experimental ability to control 10 photons. So far, our record is eight photon entanglement. We are currently working on two parallel lines to get more photon entanglement." Indeed, he says that the team's next goal is to experimentally create "the largest hyper-entangled state so far: a six-photon 18-qubit Schrödinger cat state, entangled in three degrees-of-freedom, polarization, orbital angular momentum, and spatial mode. To do this would provide us with an advanced platform for quantum communication and computation protocols". The work is published in Nature.